Concerto in D Minor BWV 1052 20'11"
Concerto in F Major BWV 1057 14'23"
Concerto in D Major BWV 1054 15'19"
Triple Concerto in A Minor for flute, violin and harpsichord BWV 1044 21'19"
Recorded Rome. Feb 1996 DDD Opus 111 OPS30 - 153 TT 71'36"
Bach wrote six works for single harpsichord, plus others for two, three or four instruments. Like so many composers of all periods, he was reluctant not to extract the maximum from anything he wrote. Musically speaking, recycling was the name of the game long before it became a fashionable thing to do in the ecological sense. The sources of these harpsichord works can be traced in other Bach scores, and indeed they in turn became the basis subsequently for more writing - as for instance the D Minor Concerto (BWV 1052) which opens the disc and which has several other versions for harpsichord. The origins of some of the adaptations can be found in violin pieces. The method of re-writing for the harpsichord from the violin was, following a transposition down a tone, to allocate the violin part to the right hand, while the left would often reinforce the bass line in the orchestra - though Bach, master that he was, never allowed the pattern to become a rigid formula. The three Concertos for the single soloist have the normal pattern - with a slow middle section framed by two quicker ones. The D Minor's opening Allegro has much of the movement's material based upon a seven-note repeated phrase from the strings, an Adagio with a slightly ponderous rhythm and a rollicking Finale. The source of the F Major can be found in the 4th Brandenburg - no attempt to hide its roots, either - with its perky opening with a prominent flute and recorder parts. Some stylish keyboard playing in the Andante leads to a swinging Allegro with all that lovely counterpoint. So much to listen out for! The D Major (1054) is based on a violin concerto (BWV 1042). Its opening - sharp and incisive, is riveting, the Adagio is allowed to drift a little, and the final Allegro cheerful. The CD notes spell out the Triple Concerto's origins - the outer movements from one source, the centrepiece from an Organ sonata. Excellent soloists on Flute and Violin - lovely tone from a 1760 instrument - are drawn from within the Concerto Italiano. The Concerto has an especially attractive complete middle Adagio for the three soloists unsupported and two outer movements with a brisk opening and an unconvincingly languid close. Direction throughout the disc is from the keyboard. 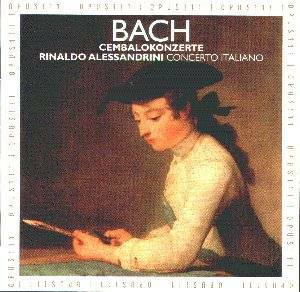 During the unaccompanied passages throughout the disc one can hear what a fine performer at the keyboard Rinaldo Alessandrini is. The recording engineers have - rightly - made no attempt to tinker with the balance but that means that the harpsichord's inherent weakness lessens its audible contribution at times. I deliberately have used the word 'swinging' which does sum up the Concerto Italiano's approach to the music. Not shallow and crowd pleasing swinging, but genuinely extracting from the score what is there to be used. Perhaps the purist may turn up the nose, but for the non-specialist this approach is welcome. This is a period instrument ensemble, and a listing of the instruments used is in the CD notes. A pleasant disc that I enjoyed though with reservations. Perhaps one to hear before buying.